Thank you President Trump! Ironic as it may be, Donald Trump has done more to stimulate real action on climate change than any other head of state, present or past. Yes– the inane Donald has officially pulled the United States out of the Paris Climate Agreement–but what is the Paris Climate Agreement other than a toothless pretense of an agreement filled with meaningless promises whose primary intention is to fool people into believing that we can trust world leaders to put the long-term health of our planet before the short-term profits of oil and gas companies? The Donald couldn’t bear the idea that anything might be thought of as more important than corporate profits—not even the life supporting atmosphere that makes human life(and corporate profits) on this planet possible. What The Donald–and his profits-are-all-that-matter buddies–failed to consider is the degree to which the US withdrawal from the Paris Agreement has compelled those who do want a healthy, functioning atmosphere to speak up and take direct local actions to save our planet—regardless of what the radical right has in mind. Some of those actions are political. Surely the recent rise of the BC Green Party has something to do with the urgency that people feel must now be assigned to caring for our planet. However, politics is only one level of action, what else are people who want to take direct action for a healthy atmosphere/planet doing to reduce fossil fuel dependence, to shift our priorities from consuming/wasting to conserving and reusing? What else can we do to ensure that The Donald’s values do not trump healthy people living on a healthy planet? Well! !– right now, there is a very interesting Comox Valley Sustainability Project(CVSP) being launched by the recently rejuvenated Comox Valley Sustainability Network(CVSN). The CVSP will attempt to make visible to all interested the many ways that valley residents are responding to the challenge of finding healthy, sustainable ways to live on our planet (regardless of American politics). The CVSP has been designed to increase understanding of how much can be done to create a more sustaining and sustainable Comox Valley/Earth by highlighting examples of sustainability already taking place in the valley and neighbouring communities. While it sometimes can seem that climate change is just too big for anything short of national governments, the CVSP intends to document and make visible the many ways that Comox Valley residents are already responding to the challenge. This month the CVSP will launch an interactive website showcasing sustainable activities and innovations from local government, utilities, organizations, businesses and individuals. 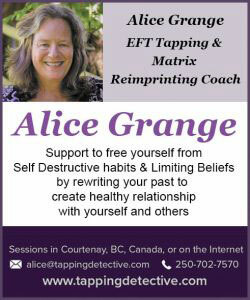 Sustainability related products and services available in the Comox Valley will also be featured. The CVSP is planning for a very interactive, information sharing website on all aspects of sustainability in the valley. The website will invite all interested in sustainability to contribute their thoughts and actions as well as their knowledge of sustainability related actions anywhere in the Comox Valley. 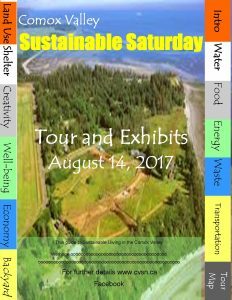 Starting this fall the CVSP will,also, sponsor an annual Sustainable Saturday Tour with an informative tour guide. Borrowing the Sustainable Saturday idea implemented successfully in other communities, and similar to local events such as the Studio Art Tour and Farm Tour, the CVSP will create a Comox Valley Sustainable Saturday Tour weekend event guide to in place, Comox Valley sustainability practices/services/products/actions. In conjunction with the tour, CVSP will sponsor a Sustainable Saturday Sustainability Fair that will feature local groups concerned with sustainability, local businesses that want to promote their sustainability related actions and/or products and services directly related to living a sustainable lifestyle. The Comox Valley Regional District will be invited to put up a display and present an overview of implementation of the 2010 municipal Sustainability Strategy. Even political parties will be invited to share information on their plans for a sustainable province. In 2018 information gathered on the CVSP website will be published and distributed as a comprehensive guide to sustainability related actions, services and products in the Comox Valley. The CVSN believes that knowledge of what is so possible that it is already being done will inspire others to initiate their own sustainability actions. CVSN sees the Sustainable Saturday events as generating social capital around acting to create a sustainable Comox Valley. The Comox Valley Sustainability Guide will also act as a reference to valley residents looking to live more sustainably in the Comox Valley. I am more excited about the CVSP than any other community project that I have heard about for a long time. Sustainability is clearly the challenge of our era. Humans will not thrive nor likely even survive unless we can learn to live more sustainably on our beautiful but endangered planet. My experience has taught me that there is a threshold of community participation/involvement when an idea almost suddenly becomes an unassailable community value. By bringing people together to learn about the practical applications of sustainability already in place in the Comox Valley the CVSP will help to move sustainability to the centre of all we do. I am especially delighted to note the effort by the CVSP to include businesses and market choices in the tour and Sustainability Guide. To be practical and effective sustainability must become part of the whole way we live which includes what we buy/and why we buy it. It must include all sectors working together to promote what is so clearly in all our interests. Just publishing the guide to sustainable choices will help to stimulate businesses to want to serve such a demonstrated market. It is my cherished hope that the CVSP will reinvigorate interest in the Comox Valley Sustainability Strategy(CVSS) which did such a good job of cross-sectoral consulting in creating the CVSS. With the interest generated in sustainability by the CVSP I hope/trust there will be increased pressure on local governments to take the CVSS recommendations more seriously. With a little luck and a lot of persistence a program like the CVSP could happen in communities all over BC, Canada—ah, THE WORLD! With a lot of determined persistence, Donald Trump will spend four years convincing us that sustainability is far too important to leave to presidents. And, then, hopefully—he’ll be gone but the lessons about building sustainable communities at the community level will be with us forever. If this post stimulates your interest in the CVSP watch for an announcement soon on the first public presentation of the CVSP. I will certainly announce it on this blog and it will be featured on the Island Word and TideChange websites. It will also be featured in the July edition of The Word. Or write to me at nreynolds (at) shaw.ca. Gird yourself–least you split a gut!